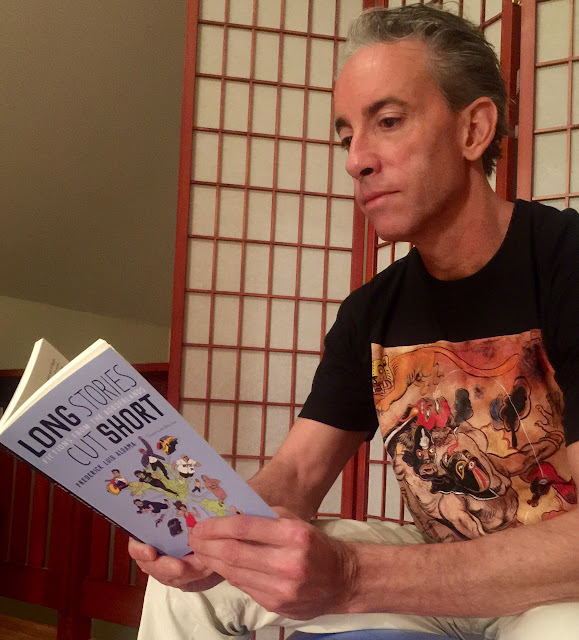 Welcome, La Bloga Readers, to a conversation with Professor Frederick Luis Aldama (The Ohio State University) who has just published Long Stories Cut Short: Fictions from the Borderlands. This small but mighty book is a transnational collaboration. Chicana writer, Denise Chávez, author of The King and Queen of Comezón, describes Long Stories Cut Short like this: "This collection of tighter tales where life is a daily balancing act asks, In what language do we articulate desire and need, love and hate? You choose. With polish and skill, the tale is told first in English, then in Spanish. Each version pains and swirls like carnival lights that form a backdrop for a living circus of souls. Aldama stuns, surprises, and delights. This is no small feat. He is a linguistic trapeze high-wire artist and delivers verbal theatrics, the likes of which will stay in your mind and heart for a very long time." Amelia M.L. Montes: Thank you so much for being with us on La Bloga today! This small “packs a punch” collection of flash fiction is a transnational, multi-genre, collaborative celebration. Tell us about all the various collaborators for this project—how you brought them together: Mapache Studios graphics, the recruitment of Ana María Shua to write the excellent forward, Jaime Hernandez’s cover art, etc. It obviously took a Latinx village! Frederick Luis Aldama: It takes a Latinx globalopolis, Amelia. That is to say, we’re a hemispheric community. We are knitted together on a global scale. And, as such, we are working together to actively transform the world—from this collection of flash fictions to the ever vital fractal crystalizing of language and culture, to our reaching across national boundaries to help nourish our familias and communities. Jaime Hernandez’s cover art captures this hemispheric sensibility beautifully. He chose some of the characters that appear throughout the fiction/graphic fictions—from X-Box videogamer and cholo cyber-punkers to romancing abuelos and philosophically musing infants and Kurt Cobain Latina listening teens—and drew them springing superhero style out of a map of the Americas. He captures in one flash of the eye, the great variety of who we are—and our superheroism in a world that constantly threatens to crush us. From the moment pen touched paper with the first super micro (nano) fiction—“When she woke up, the hunger pangs were still there,” an homage to the great practitioner of the form, Tito Monterroso and his “Cuando despertó, el dinosaurio todavía estaba allí”—I conceived of this as an intertwining alphabetic and graphic fiction work. I reached out to my compadres in Chile, Rodrigo and Fernando of Mapache Studios, because their extraordinary talent, but also to infuse a perspective of Latinx identity and experience from those grown in a shared hemispheric soil, but differently nuanced. For instance, the story “Cell 113”/”Celda 113” they bring to bear their trademark exquisite line work and clean inking to expand in our imaginations what it means to be incarcerated as a Latino: the story is told from the perspective of a US Latino thrown in jail for some stupid mistake and the drawing is set within one of Pinochet’s jails where so-called dissidents (workers, students, activists) were tortured, murdered . . . disappeared. The alphabetic text together with Mapache Studio’s art creats an expansive experience—one that mirrors our Latinx community where distant and proximate memory and physical experience tie us all together. There’s Tito Monterroso and there is Ana María Shua. She’s taken the flash fiction form to a new level of refinement, both in form and content. She’s a master of concision whereby the careful selection out of words—the sculpting down from that block of marble to its bare minimum for our imagination to go somewhere new—also reshapes how we encounter philosophy, biology, physics, journalism . . . She takes what some might consider the high brow and off limits and anchors it in the everyday—and with a quick punch. She’s an inspiration to us U.S. grown Latinx authors who seek to make new the reader’s perspective, thought, and feeling about the world we live in. Amelia M.L. Montes: The Prelude is very filmic—flashes of scenes that then can be connected to longer pieces in the three sections following. In your earlier drafts, is that how you originally conceived the book? I’m interested here in the process of crafting text. When I conceived of the Prelude, I wanted to include a series of one-line flash fictions that not only pay homage to Tito Monterroso, but as you so astutely identify, they at once mirror this triptych structure of the whole book and they drop suggestive nibbles (micro themes) for our minds to recall and envelope as we move through the immersive prose-graphic fictions that more fully flesh out the complex spectrum of Latinx experiences and identities that fill out the rest of the book. Frederick Luis Aldama reading his book. I’m pretty certain that this is the first bilingual flash fiction/graphic fiction book conceived and published as an organic whole. As I mention earlier, each of its three main sections interrelate and build a total tapestry of the Latinx experience in and through our three main phases of life. I did this to add further depth and scope to each story, so that each one would stand on its own as an individual entity while also creating a total net as woven into the others. Put otherwise, in a performative way, each story is about very different Latinx subjects as they interrelate to a larger, hemispheric experience as a whole. It’s the ontological and epistemological case of the particular within the communal and the communal being expressed within the particular. Amelia M.L. 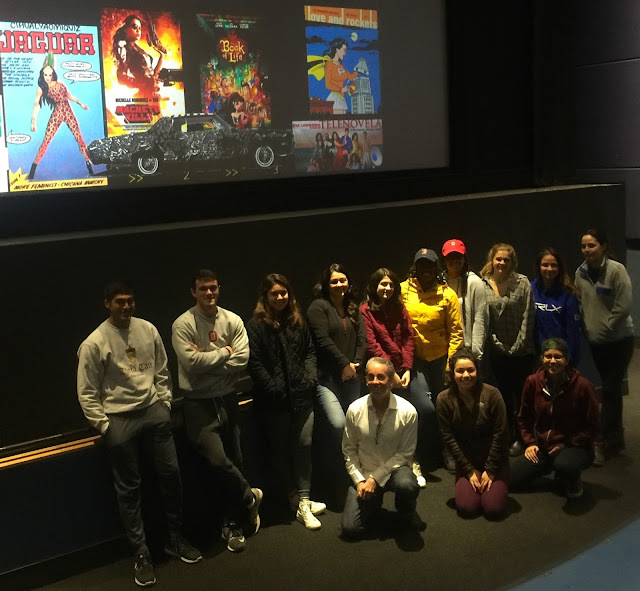 Montes: With each section, “Beginnings,” “Middles,” “Ends,” the ‘filmic’ narrative pans across many lives, many moments cutting across class, gender, sexuality, and culture, culminating in a woman’s defense of how she has lived right before she dies. You call it, in your “author’s note,” a “format to give shape to the triptych of life.” Tell us more about your decision to end this triptych with a woman’s defense. Frederick Luis Aldama: Amelia, you are clearly the ideal reader of Long Stories Cut Short—or better, a “lector complice” as Julio Cortázar calls such an engaged reading subject. As you so astutely identify, there’s a sense of a camera panning across the stories as a whole and that drops us incisively into each of lives that make up this whole. In the story, “A Long Story Cut Short” that concludes the section “Ends,” we meet an ABUELITA we might all recognize. She’s superheroic strong in ways we can’t even imagine, deciding that she won’t have a better life but by strategically marrying an Irish American wannabe cowboy (Andrew) from her neighborhood, she might give the next generation a chance. It’s not out of love that she marries. In a racist world where all is foreclosed for a Latina, she deliberately seeks to reproduce with someone who will give the next generation lighter skin, and with this, more options. She’s fierce. Yet, she is filled with an internalized prejudice. She grew up in an L.A. chock full of movie stars, films like Gone with the Wind, and popular print media like LIFE—social mirrors that normalize whiteness. As she takes in her final series of breaths, we see how in late adulthood, she awakens to the vacuousness of the American Dream. “Andrew proved to have nothing in him. Never was worth more than the price of a photograph of John Wayne.” And in death, she fully lives life. And while there’s a certain irony in her experiencing the rich textures of a full life in death, her last breath comes from a place of strength and not regret. Amelia M.L. Montes: Unlike most fiction works written in two languages where, say, the English is clearly separated from the Spanish, in Long Stories Cut Short, there is a seamless flow between the two. Tell us about this flow. Frederick Luis Aldama: Much like the placement of the graphic art pieces, so too did I conceive of the move from English into Spanish as fluid and expansive. As the English story ends, the story in Spanish begins—and without the interruption of a page break. It reflects how those in our Latinx communities move back and forth seamlessly between the two in all variety of ways. In this way, they capture how we exist as a multilingual and multisensorial hemispheric community. And, the seamless flow between the two languages erase this sense of privileging one language as the “original” over another as the “duplicate.” We struggle with this in our everyday existence, no? The experience of the stories is expansive precisely because of the seamless layout between English and Spanish. And, while they clearly share the same DNA (characters and content), I purposefully created them as an organic whole whereby the Spanish story worlds add to the English and vice versa.